Today I'm feeling a little more permanent. A couple of weeks ago, the Christian Education Board at our church voted to staff me permanently at the church... meaning I'm no longer on probationary/provisional employment. 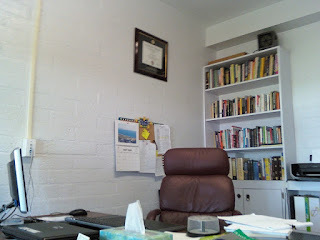 So, today I decided to go ahead and hang my degree on the wall of my office. I guess they're crazy enough to keep me around.